Today's family of orbiters, landers, and rovers. 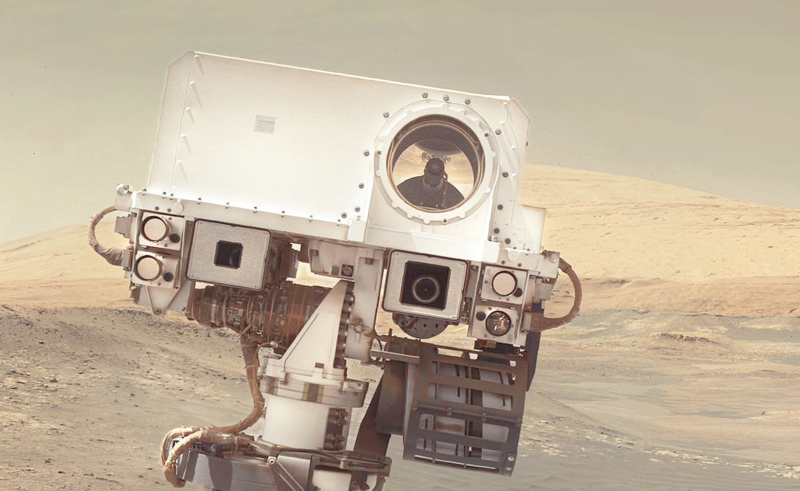 The rover named Curiosity takes a selfie photo on planet Mars. A gallery of images + historic profiles. Mars is home to a wide range of robots: orbiters, landers, and rovers. Mars may be a barren desert with no alien life — that we know of — but the planet isn’t lifeless. Thanks to Earth’s ambitious space programs, several robotic labs explore the Martian surface plus its skies. Every 26 months there’s an opportunity to send a space vehicle from Earth to our neighboring planet Mars, in an efficient trajectory. The trip can take 6 months or more. Probes to Mars often fail. In the gallery and profile set below, you’ll learn all about the spacecraft that successfully voyaged to Mars — that are still actively exploring. NASA calls these current missions. The average distance from our sun to a planet or moon in our solar system is measured in units called astronomical units: the abbreviation is AU. One astronomical unit is about the distance from Earth to the sun. But that distance varies as Earth orbits the sun, from a maximum (called: aphelion) to a minimum (called: perihelion) — and back again, once a year. So 1 AU is defined as approx. 93 million miles. The astronomical unit is used for measuring distances inside our solar system, or around other stars. But it’s also built-in to another measure of astronomical length — called the ParSec. 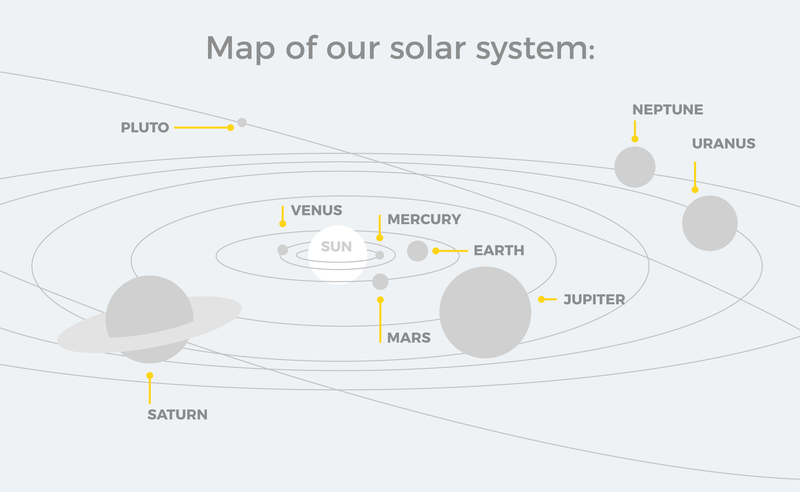 watch — animation: how big is the solar system? A space probe is a spacecraft equipped to leave Earth on a mission to fly-by or orbit around: the sun, another planet, moon, asteroid, or meteor — or go beyond our solar system. An impact probe is a special purpose space probe designed to deliberately crash into a planet, moon, or asteroid. Impact probes are outfitted with equipment to handle colliding with the surface. The purpose of the impact is to kick-up dust, rocks, and water found on the ground — so that the debris can be studied by on-board lab equipment. An orbiter is a space probe designed to circle a planet, moon, or the sun — from orbit outside a planet’s atmosphere. Orbiters are also called satellites, equipped with on-board equipment to scan the surface below to detect radiation, heat, dust, water, gases — and map the topography and geology of a planet or moon. They also have advanced communications equipment to relay data back to Earth from their mission. A rover is a robotic vehicle + mobile lab that can be operated at-at-distance from space or Earth. It can go where astronauts can’t. It’s carried by spacecraft to the moon, an asteroid, or Mars — where it lands on the surface and deploys: wheels, solar panels, remote-control devices, robotic arms + tools, antennas, cameras, communications devices. A rover is outfitted with navigation gear — designed to travel on the surface of the moon, an asteroid, or Mars looking at terrain, checking weather, and making maps. Equipped with science instruments and electronic sensors, a rover can drive to a spot on the ground to collect samples of soil, dust, air, sunlight, water for lab studies — and take vital signs like temperature + motion. With powerful cameras it can photograph the environment. With special gear, and using satellites, it transmits information back to Earth so scientists have a close-up view — even though the moon, asteroids, and Mars are so far away. A robotic lander is essentially the same concept as a rover — except a lander is not designed to travel on the surface of the moon, asteroids, or Mars. A lander is a stationary lab and cannot move. Both landers + rovers are transported — from Earth to the moon, asteroids, or Mars — in the same way. Powerful propulsion rockets launch spacecraft beyond Earth’s atmosphere and orbit. The rockets separate off the spacecraft and tumble back to Earth. But the spacecraft continues on its journey to remote space destinations. The spacecraft is designed to travel long distances. It carries the lander or rover along with it — and when it arrives deploys the lander or rover so they can descend to the surface where they will stay permanently. Both landers + rovers conduct scientific experiments on the surface and are outfitted with advanced tools. And they can’t lift off, can’t fly, and can’t journey back to Earth. Also, there are no modern re-entry spacecraft that can descend to pick-up a lander or rover on the ground — and bring it home. 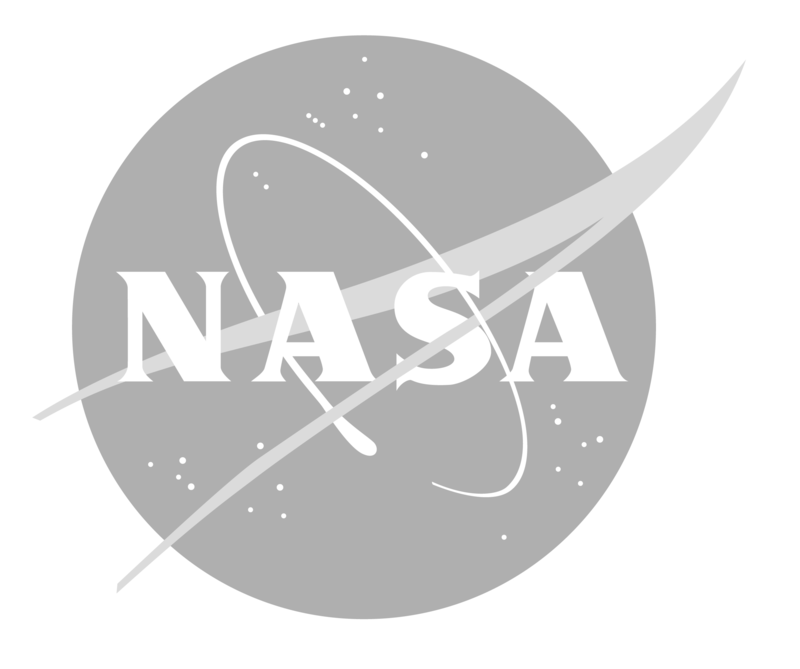 * NASA is the US National Aeronautics + Space Admin. deck: Today’s family of orbiters, landers, and rovers.